Where have I been?! Under a rock?! I cannot believe I managed to miss the fact that we are getting another Lady Trent book. For some strange reason I swore that the Voyage of the Basilisk was the last installment to the Lady Trent Series. Which was in fact why I have put off reading the darn thing over the last year. I wasn't ready to say good-bye to one of my favorite female characters, no matter how flawed she was. The book as been sitting on my self mocking me for almost a year because I was a single book away from finishing the series. Then I'm browsing through Goodreads' giveaway section and BOOM! Look book number four! Needless to say I have entered to win the book, marked my calendar for April 5th, and I am ready to pre-order my copy through the bookstore. This also means that I have pulled the third book off my shelf and added it to my TBR pile once again. However, I haven't heard whether this will be the final installment of the book or not. Despite some opinions I've read I do really enjoy this series, and the author herself. I had the great pleasure of getting to meet Marie Brennan last year and the illustrated for her books. If you haven't seen the covers, or drawings inside these books you are missing out on something. I thought the Voyage of the Basilisk was the best cover to date, but Todd Lockwood has out down himself again. The cover for In the Labyrinth of Drakes is beautiful. I thought the only book I was looking forward to this year was Morning Star, but I was mistaken. There might have been some squealing when I saw this, maybe some dancing, and an immediate text to a friend of mine who also adores this series. 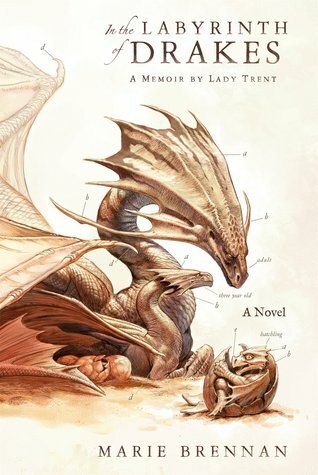 So if you haven't checked out the first book, A Natural History of Dragons, you should! The books has Victorian ladies stepping out of their deemed societal role, dragons, exotic locations, dragons, and people get eaten. Plus the drawings inside the book are breath taking.